Come. Enter the mystery of the forest ~ find the abundance of nature, hand-in-hand with your child. You are a parent… and, maybe, a grandparent. You want your young ones to feel peace and protection as they walk in the meadows and forests. You hope they feel serenity and welcome as they sit beside a stream or lake. You wish for them to see the plants and animals of all these places as companions, not threats. (Well, most of them.) You want them to care about, and for, their home ~ this earth. And, you want your children to know that they can turn to nature for their own guidance, nourishment, shelter, healing and joy, all of their lives. Because this is something you know, or once knew, or have quietly sensed, or crave yourself. Yet, you need help, dear parent, because you’re working against a culture that has forgotten the practical benefits and restorative mysteries of nature. You long for the wisdom and magic that was once handed down from generation to generation. Maybe you long for a guiding Elder ~ one who traditionally did this teaching? 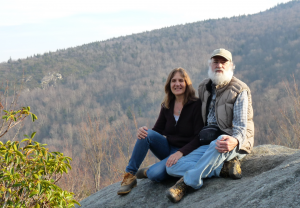 We are Harry LeBlanc and Deb Vail, co-founders of Grandparents of the Forest. We want to bring to life the enduring wisdom of nature to as many people as possible ~ especially to the impressionable young ones. We know that humans protect the people, ideas and things they love. Because you are reading this, we already know that you love your children and want the best for them. We believe that when people know and cherish their habitat, they will protect it as well, and will come to see it as a protector, too. We believe that educating, empowering and igniting the imagination of children within the natural world is one of the most important responsibilities that caring adults can fulfill. We have learned, through our lives, that nature is here for us, stewarding us and showing us, through her myriad tiny and immense examples, all the wisdom needed to have vital lives. And we believe our greatest opportunity is to receive this wisdom with awe and deep respect as well as to steward her well in return. We also believe it is imperative to pass the knowledge of this sacred connection down as it used to be handed down to children from parent, from grandparent, from great grandparent from… the Elders. We offer ways to begin an interactive relationship with nature: one that will open wisdom, mysteries and connections for your family. Hand-crafted Sacred Forest® flower essences as gentle healing aids. Mentoring resources to help both your child and you with sleep, restorative emotional well-being and the enhancement of joy, vitality and love for life. Simple inspirations and kindly reminders to open your heart and connect to nature, delivered by email and mail. Locally, we lead guided walks in the forest to develop empathy and understanding of plants, trees, animals, insects, weather, seasons, rocks and the skies. We believe now is the time to restore the essential transfer of the Wisdom of Nature; rekindle children’s young imaginations; nurture their faith, understanding and appreciation of nature’s gifts; and reinvigorate their passion about Living Nature. Please join us in this amazing world of wonder and discovery! Grandparents of the Forest is here to guide you. We invite you to explore our offerings.